Uttar Pradesh has been one of the most influential cities in India and its charisma has inspired a lot of travelers and foreigners to come and learn more about its culture and history. This north Indian state has also been the home to a lot of great thinkers, and philosophers, dancers and musicians, poets and writers, artistes and artisans, leaders and politicians, intellectuals and academics. The cities in Uttar Pradesh tell its own story that constantly keeps mesmerizing not only the people of India but also the foreign travelers. Beginning with the capital city of Uttar Pradesh, Lucknow was established by the Nawabs who were from Oudh in the 17th century. The city is famous for its architectural monuments that were built by the Mughals during their rule. This is one of the fastest growing cities in terms of economy and one amongst the top ten non-metropolitan cities of India. Lucknow is one of the most important cities in Uttar Pradesh and enjoys popularity throughout India. 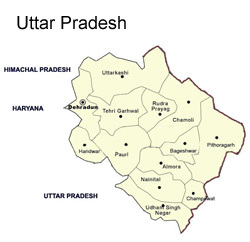 Amongst the other cities of Uttar Pradesh Agra deserves a special mention. This city is famous all over the world for its magnificent piece of Mughal architecture, Taj Mahal which is better known as the symbol of love. This city has remained the retreat of the Mughals for a fairly long period of time and hence is one of the most beautiful cities in Uttar Pradesh. Shahjahan, the Mughal ruler tried his level best to enrich the beauty of this city by establishing beautiful square shaped gardens. Allahabad is one of the important cities in Uttar Pradesh that is known as the venue for the Kumbh Mela. It is one of the largest cities in Uttar Pradesh and is also popular as a spot where the holy Ganga and Yamuna rivers join together. Varanasi is one of the holy cities and holds an important place in Hindu pilgrimage also. One can visit the holy shrine of Lord Kashi Vishwanath here and this city has also been linked with Buddhism and Jainism. All these cities call for a sure visit since they have something unique to offer to the tourists in terms of information and lots of other tourist attractions. Most of the pilgrim points of Hindus are located in this erstwhile state.